Greetings and happy Tuesday! The electrician and I had a fun day on Saturday switching out light fixtures at Happy Hill. Well, it was fun for me. Come see how the new ones look! And this is one of the existing ones I was trying to match: Note these have the chrome base. When the electrician (Davey) took down these two light fixtures he found a potential disaster waiting to happen. One of the sockets on one of the lights had a bad connection or something and nearly caught fire. The light bulb was hanging on by a thread and the socket itself had overheated and melted. It’s hard to see but the threaded post in the middle of the fixture was charred from smoke. So scary! And the irony is these light fixtures were brand new when we hung them originally. So, calamity averted. Thank Heaven! I tossed them in the trash. I wish I had painted the ceiling before he put up the nautical light fixtures, but I didn’t want to waste his time so I’ll touch up the ceiling later. I love that all of the fixtures match now. Yay! Davey recommended using LED lights in all of the fixtures. 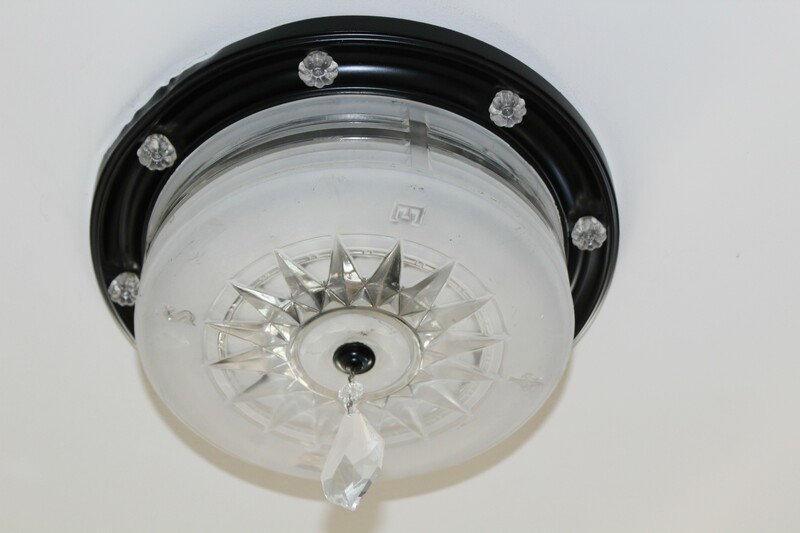 They are cooler to the touch therefore in a closed glass fixture like these, the glass won’t get as hot as with regular bulbs. Plus, supposedly they last much longer. The old fixture in the kitchen was not my cup of tea. And the new one makes my heart sing. I debated on whether to switch out the light in the hallway since it was original to the house. I switched out a few more that I’ll share later. My agreement with my husband is the basement is his space and therefore he gets to keep the manly vibe. So, no chandeliers down there! But the upstairs is my domain so I get to doll it up like I please. Deal!